"At the southern tip of the Italian peninsula lies an Italy that few people know: a land of fragrant citron and bergamot orchards, ancient olive groves and terraced vineyards; a place of tradition and ritual, where the annual swordfish catch and hot pepper harvest are celebrated with elaborate festivals, and where women still roll pasta dough around knitting needles." So begins "My Calabria", a cookbook devoted to the distinctive cuisine of Calabria. 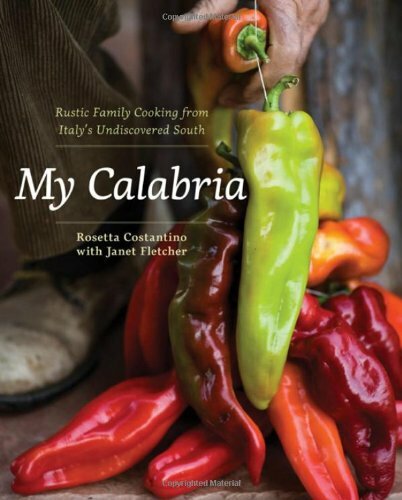 In "My Calabria", Rosetta collects 150 heretofore-unrecorded recipes, from antipasti to dessert, inspired by her family's lush garden and the old ways of Calabrian cooks. Her recipes create delectable, healthful meals that let seasonal ingredients shine, showing how perfectly suited Calabrian cooking is to the way we eat today. The book also includes an armchair tour of the region for travelers: a list of places to stay and eat, a resource guide for less-familiar ingredients and a section on the culture and history of Calabria. San Francisco wine authority Shelley Lindgren has provided southern Italian wine suggestions for the recipes, along with more widely available alternatives. "My Calabria" documents a vanishing way of life, a region whose people celebrate the homegrown and homemade, a place where recipes are not written down but passed down. With Sara Remington's beautiful color photography, "My Calabria" will be savored and admired. A story of a place and a family, this is a must-have cookbook for every home cook in search of new recipes for uncomplicated, delicious Italian food.